With early-learning classes for the kids and housing help, Amy Krajci says Wellspring Family Services helped bring her and her children a "safe, normal, healthy family life." She is now taking classes toward a college degree. For years, Amy Krajci fought back against the chaos in her life. She experienced homelessness and battled methamphetamine addiction. She survived two abusive relationships, the last one culminating on a cliff in South King County. There, she said, her boyfriend demanded she remove her clothes, which were bloody after he’d broken her nose. He stuffed her clothing in a bag and threw them over the edge. That’s gonna be you next, he told her. Krajci talked him down and eventually got away. She spent the next several years climbing out of that dark place and working to overcome her addiction. The path eventually led her to Wellspring Family Services in 2016, which has helped the young mother of two by providing child care, helping her secure housing and continuing to be a resource even now that she’s in an apartment of her own. “There’s hope out there. With Wellspring, you can have a normal family life — a safe, normal, healthy family life. It’s possible. It’s possible to come from nothing,” said Krajci, 24. Founded in 1892, Wellspring Family Services, on Seattle’s Rainier Avenue South, works to end the cycle of family homelessness. It focuses, in part, on children’s early learning, mental health, preventing domestic violence, helping clients connect to housing and, in general, providing a variety of services that can stabilize the family. It is one of 12 organizations that benefit from The Seattle Times’ annual Fund For The Needy donation drive. “Our goal is to become that safety net for these families,” said Sherry Nebel, Wellspring’s executive stewardship officer. Almost half of those kids were in elementary school, a critical time when homelessness can have long-term effects. That is why Wellspring works hard to break the pattern. Krajci encountered Wellspring while living in Hope Place, a residential recovery shelter run by Union Gospel Mission. She was trying to balance her recovery classes with caring for her young daughters. Then she noticed her friend, also enrolled in the same program, never brought her young son to their classes. One day, Krajci saw a van drop off the little boy at the shelter. He was enrolled in Wellspring’s Early Learning Center, a free preschool program for children ages 1 to 5 who are either currently or recently homeless. Wouldn’t that be nice, Krajci thought, if her kids could go there? She got them enrolled. Suddenly, she could tick items off her to-do list. “I had more time to get appointments made, get on housing lists, do research on school,” she said. That also allowed her to focus more on her children when they got home. The Early Learning Center specializes in working with children who’ve experienced trauma. But it looks and feels like any typical school, with brightly decorated classrooms and a playground. A map along one hallway details the many countries from where children in the program hail: Angola, Peru, Ukraine. The program was particularly helpful for Krajci’s oldest daughter, now 4, who had witnessed her mother experience abuse. She spent the first years of her life living with her grandparents because Krajci was still dealing with her addiction. Since enrolling at the learning center, the girl’s vocabulary, reading comprehension, writing and social skills have improved. This ties into Wellspring’s philosophy that addressing a family’s overall needs is key to keep them from slipping back into homelessness. “Stability isn’t just about housing,” said Fitzpatrick, the Wellspring CEO. “You have to address a lot of things at the same time.” To that end, the organization offers counseling services on site. Through the Early Learning Center, celebrating its 30th anniversary this year, Wellspring provides family-stability specialists to work with parents. A Wellspring housing-stability specialist — one of 10 on staff — also helped Krajci find a place to live. Wellspring doesn’t own housing, but it has relationships with roughly 200 landlords, Nebel said, although Wellspring has increasingly struggled to find affordable housing for clients in Seattle because of rising rents. As Krajci and her housing specialist filled out a pile of housing applications, Krajci felt like she had options. She got lucky, landing a subsidized apartment in Seattle. Krajci said she never could have navigated the local housing system on her own. “There’s no way,” she said. 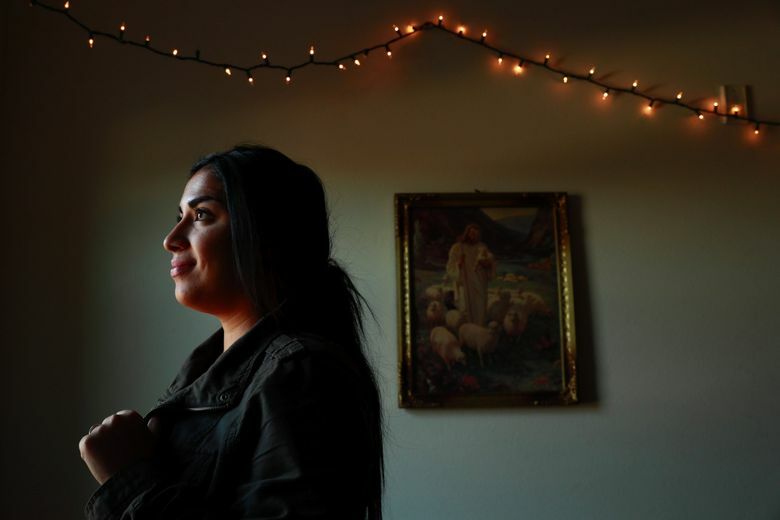 She is now taking college classes toward a degree in behavioral applied science, with hopes of eventually getting a job in a psychiatric hospital or working with female inmates. Her relationship with Wellspring continues. Her daughters are still enrolled in the Early Learning Center, although the van no longer picks up the girls and drops them off — a casualty of funding cuts. At the Baby Boutique, Krajci has picked up clothes, toys, books and toiletries for her daughters. That’s what Krajci is finally beginning to feel. The walls of her two-bedroom apartment are covered with photos of her smiling daughters and framed motivational sayings.